Well 2QB folks, it’s about that time. As we head into June and the summer, the fantasy focus is shifting from dynasty formats to redraft. Free agency and the draft are over, the dust is mostly settled, and all we have on the horizon are OTAs and camp competitions. Compared to my inaugural edition, the big board has undergone a serious makeover. You’ll see just how deep the quarterback class is, and while LRQB may be becoming too popular in normal formats, I’m not convinced it needs to go anywhere in 2QB leagues unless your elite QB1s are falling well below their ADP. I’d be extremely satisfied with a trio of Alex Smith, Tyrod Taylor, and Matthew Stafford in 2016, for example. Elite QB1 Aaron Rodgers GB Aaron Rodgers' finishes since 2010: QB2, QB1, QB1, QB22 (9 games), QB1, QB7. Last season marked a "down" year for Rodgers and the entire Packers offense. Elite QB1 Cam Newton CAR Coming off a career year, Cam should only benefit from the return of a healthy Kelvin Benjamin. With 10 of his 45 touchdowns coming on the ground, Cam is likely to regress at QB, but not enough to affect his high production floor. Elite QB1 Drew Brees NO He's been neck and neck with Rodgers in terms of being fantasy's most consistenly prolific QB. No matter who he's throwing to, Brees is a near lock for a Top Six finish year after year. The fantasy community needs to stop doubting him. Elite QB1 Andrew Luck IND As overrated as Andrew Luck has been, the team has relic Frank Gore at running back, spent a first round pick on protection for Luck, and still has a shoddy defense. This team is built for Luck to maintain passing volume. Reliable QB1 Russell Wilson SEA After a career year as a passer in 2015, word is that the Seahawks will scale back the passing game. Regardless, he's finished no worse than QB11 since entering the league in predominantly run heavy offenses. High floor option. Reliable QB1 Philip Rivers SD Rivers is being hyped as a league winner this offseason, and it's tough to disagree. As Evan Silva pointed out, he was the QB2 when Keenan Allen was in the lineup, and now gets a healthy offensive line and a deep threat in Travis Benjamin. Reliable QB1 Ben Roethlisberger PIT After 2015, you have to start to wonder how much longer his body will hold up, but he's averaged 19 points per game the past two seasons. The addition of Ladarius Green gives him another dangerous weapon in the red zone. Reliable QB1 Eli Manning NYG Back to back QB1 finishes since Ben McAdoo has taken over the offense. Now gets Sterling Shepard, and pennies from heaven if Victor Cruz is healthy. Manning also had the fourth most dropped passes working against him, a stat that should improve in 2016. Reliable QB1 Carson Palmer ARZ Palmer is a tough rank for 2016. Has been a points per game stud the past two seasons and boasts one of the most potent offenses, but it has been against cake competition. I'm cautiously optimistic for him in 2016. I might pass on him if his ADP puts him near the top five QBs. Reliable QB1 Tom Brady NE Brady would be my QB3 if it weren't for the suspension. He should be a prime value play if your leaguemates overestimate his suspension. Reliable QB1 Andy Dalton CIN Before getting hurt, Dalton was one of the league's most efficient passers. Don't let the loss of Marvin Jones and Mohamed Sanu cause for concern, as Dalton plays in a division riddled with porous defenses. Reliable QB1 Tony Romo DAL Most of the reasons Romo was hyped in 2015 still remain. Where some see Elliott as a threat to Romo, I see it as a relief. Romo was QB8 in points per game in 2014 during Murray's career year. High End QB2 Jay Cutler CHI Cutler is a huge sleeper in 2016. Suspect defense, the loss of the reliable Matt Forte, and a return to health for both Alshon Jeffery and Kevin White all point to more volume for Cutler. Oh yeah, fftoolbox.com ranks the Bears as having the fourth easiest schedule for QBs. High End QB2 Kirk Cousins WAS Cousins is a player I want to hate, but just can't. While a lot of his success will be tied to the health of two injury prone players, he was extremely reliable in 2015. As Scott Kacsmar points out, he also wasn't the beneficiary of garbage time like some breakout QBs last season. High End QB2 Marcus Mariota TEN Mariota has been given arguably the most support of any QB this offseason, as the Titans have added two offensive lineman in the draft, two running backs, and two receivers. With more of an emphasis on running the ball (both with and without Mariota) the arrow is pointing up for the Titans offense. High End QB2 Matt Ryan ATL Matt Ryan has been consistently mediocre, but I don't think he was as bad as 2015 suggests. Outside of Julio Jones, the Falcons had next to nothing for pass catchers. Austin Hooper and Sanu aren't much, but they're a step in the right direction. High End QB2 Tyrod Taylor BUF Another potential bargain for his ADP. While the team's lack of commitment is worrisome for dynasty owners, redraft owners should be more concerned with Sammy Watkin's injury. While his production remained neutral in the two games Watkins missed, missing a top weapon is never good for any QB. High End QB2 Derek Carr OAK Surprised everyone in 2015, but as Pat Thorman points out, he really benefitted from playing against weak competition. High floor, low ceiling option at QB. High End QB2 Joe Flacco BAL I'm getting wacko for Flacco again in 2016. Has the seventh easiest QB schedule, has been given Ben Watson, Mike Wallace, and a healthy Breshad Perriman, as well as offensive line support. With five QB1 finishes in 10 games last season, there's a very high possibility that Flacco will outperform his ADP. High End QB2 Blake Bortles JAX On the same table where we pointed out Kirk Cousins wasn't a garbage time QB, we can see Bortles as a garbage time king, with nearly 30% of his production coming from the team trailing in the second half. With an improved defense and the signing off Chris Ivory to bolster redzone rushing production, Bortles is the most obvious regression candidate. Reliable QB2 Jameis Winston TB He was startable in 15 weeks in 2015, but relied on six rushing scores to boon his production. 2016 looks to be more difficult, but he may be a playoff hero with two matchups against the Saints. Reliable QB2 Matthew Stafford DET Boast's fantasy's easiest schedule for QBs in 2016, but lost the rising tide to his boat in Calvin Johnson. Megatron aside, the Lions still have a serviceable offense that includes an effective Golden Tate, red zone threat Marvin Jones, ascending Eric Ebron, and a stable of backs that can catch the ball. Maybe Stafford isn't doomed just yet. Reliable QB2 Ryan Tannehill MIA Tannehill may be seen by some as a post hype sleeper given his QB friendly head coach in Adam gase, but we may be looking at another Matt Ryan here. It's a make or break year for Tannehill as he is flush with weapons and should see more passing volume with the loss of Lamar Miller. Reliable QB2 Alex Smith KC With only one finish outside the top 24 last season, Smith is about as reliable as it gets. Year in and year out, he's the guy that won't win you games, but he certainly won't lose them. Low End QB2 Teddy Bridgewater MIN Teddy B left many owners with egg on their faces after 2015, but a lack of receiving options and battered offensive line didn't do him any favors either. With Norv Turner finally getting his alpha receiver in Laquon Treadwell, this can be the year we see significant growth. With the fifth easiest schedule, things may be looking up for Teddy, but don't hold your breath. Low End QB2 Brock Osweiler HOU Osweiler is truly a mystery for redraft owners. He had decent production in one of the league's most talented offenses last season, and now joins a revamped Texans offense that has upgraded at receiver and running back. The problem is he simply wasn't that good in limited action last year. If he grows, Osweiler could be a huge bargain for 2QBers. Low End QB2 Robert Griffin III CLE Another big wild card at QB. He doesn't have many weapons and figures to be in a run heavy offense. A reclamation is possible, but there needs to be evidence of it. Low End QB2 Jared Goff STL Goff doesn't figure to have much ceiling in year one of a Jeff Fisher offense that lacks quality receiving options. Look for the Rams to run the ball to ease Goff into the NFL. Low End QB2 Mark Sanchez DEN Sanchize can be another potential ADP steal. Gary Kubiak's offense is the best system for his skillset that he's played in so far and he'll have one of the league's best receiving duos. The question is can he stave off Paxton Lynch? 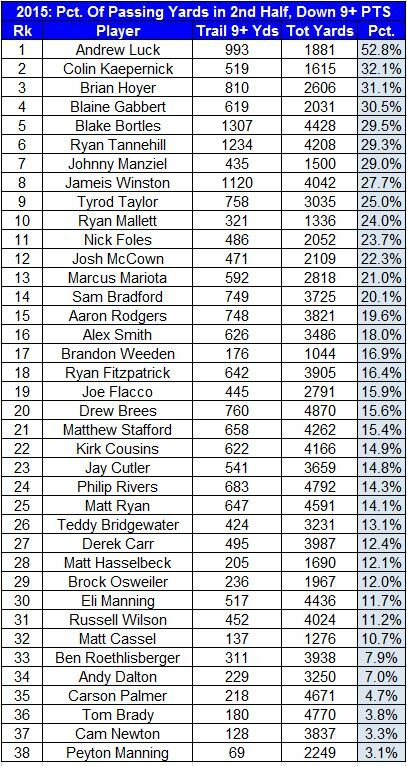 Low End QB2 Sam Bradford PHI I may be in the minority here, but I think turning Sam Bradford into Alex Smith will only be good for him. One has to wonder if the team is really committed to sitting Wentz in year one, however, and there are always the lingering health questions. Low End QB2 Blaine Gabbert SF The job appears to be rigged for Gabbert to lose. Chip Kelly's scheme may be a good fit for him, but a poor roster may mean Gabbert is this year's Sam Bradford. Low End QB2 Colin Kaepernick SF See above. Injured, lack of time in the system, and the deck looks rigged for Kaepernick. If he somehow wins the job, he'd probably rise another four to five spots. Fliers Jimmy Garoppolo NE As Sal points out, Jimmy G may be a good option to draft late if Brady's suspension holds up. With an opening slate against the Cardinals, Bills, Texans, and Dolphins, Garoppolo looks like an early streaming candidate. Fliers Geno Smith NYJ The de facto starter if Ryan Fitzpatrick isn't re-signed, Smith will be surrounded by weapons and was actually a QB1 in his lone spot start in 2015. Still, there's not much to be inspired by. Fliers Josh McCown CLE If he beats out RG3, he'd obviously rise, and was very serviceable in 2015. Fliers Ryan Fitzpatrick If he does return with the Jets, Fitzmagic will be a reliable QB2. They have a much tougher schedule in 2016 and one has to wonder how much of last year was a fluke. Fliers Paxton Lynch DEN Has a chance to beat out Sanchez, but don't count on it. Definitely an intriguing play if he does see time as the starter. Fliers Carson Wentz PHI Will we see him in 2016? Fliers Chase Daniel PHI No way he beats out Bradford….or is there?